Fantastic weather on the Buckle, we walked in early with other parties heading for the poular routes of Crowberry Gully, Curved Ridge. Another pair had a "slip" on Raven's Gully V.6 (they were ok if a little shaken and limping). We climbed North Buttress IV.4 which is an obvious route linking a series of chimneys on the big buttress. Navigating to the route is fairly simple (especially with blue skies). Follow the well trodden path until you cross the prominent stream, then scramble up towards the 2 large boulders silhoueted on the ridge. When you're on the ridge head upwards to the obvious chimneys and the start of the route. Conditions were good, but a little more freeze/thaw will increase the number of ice axe placements. It is a mixed route so be prepared for conditions as shown in the picture above (especially on the crux moves). No need for ice screws but got some great Nut and Hex placements. It's got some great wee cracks to hook your tools into. The snow was stable so we decended down the gully of Coire na Tullach, with a bit of glissading (bum slides) to loose height swiftly. BEWARE - this is not an appropriate decent if avalanche conditions are poor. Back to the car and off for an early and well earned fish & chip supper. A great day's climbing on The Ben. It was cold last night and minus 8.5c when I met Dan (from Real Adventure) and Bridget, my "clients" for guiding today. We used a key to the forest gate and drove up in my Golf (more instructors seem to have VW's and La Sportiva winter boots than any other brands). I have winter tyres and chains - couldn't have got up the track without them. North Face of the Ben whilst walking in. 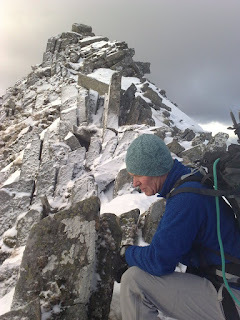 It was an interesting day apart from the climbing - we saw a fell runner in his shorts on the summit (wow! ), people scrambling just above the start of Tower Ridge at 4pm (wow - have a headtorch and/or be sleeping out the night) and somebody using ice axes to make an ascent of the shelter on the Ben's summit! My instructor plan was to guide Harrison's Climb Direct, a IV.4 four-star on Carn Dearg Buttress, but it looked thin of ice from the track so we headed up towards Italian Climb, but it also loked thin, so we kept ascending to climb Glover's Chimney III.4 which meets the ridge at Tower Gap, then follows Tower Ridge to the top. Glover's Chimney is in the book 'Cold Climbs' but we had it ot ourselves. The initial ice is good, then it's a long easier plod up steep snow before the final rocky chimney, a rock climbing conclusion before it meeets Tower Ridge at at knife edge point of the ridge but you can clip the in-situ rope before scrambling on up out of Tower Gap and heading on to the summit. Navigation was a doddle today - superb views and tracks in the snow to follow. Though one lady did walk over to us at the top of Tower Ridge to ask if it was the decent gully. Walking down to the decent at Number 4 gully. The cornice on No 4 gulley had been cut through so the decent was ok and the snow was soft enough for some swift glissading. Climbing Conditions - plenty of low down ice; higher up it's not been warm enough for water or snow to consolidate so lots of fluffy white stuff but it's not good for whacking pic's into. The icefalls bewlow the CiC look good, The Curtain isn't in codition. Italian Climb looked like the snow was unconsolidated; Italian Right-Hand looked thin; and Vanishing Gully looked like it might be OK. Ridges look great though. Valentines Day, and time for a a fun indoor climbing day with people from Lowe Alpine. For many month I've offered to take Rob and Tanya's family climbing at Kendal Climbing Wall. Rob and Tanta are the Lowe Alpine Technicians who ensure the design information is transfered accuratelly to the production staff. After a few fun warm-up games they were soon bouldering and scrambling in the bouldering chambers before going into the main area and climbing up the steep walls. Outside it was cold and ice had formed overnight on car windscreen..
Next weekend I'll be off to Scotland for some winter climbing and mountaineering, possibly on Ben Nevis. The weather (winds and new snow) mean it may be routes on ridges, possibly Towere Ridge, to avoid cornices and avalanches. 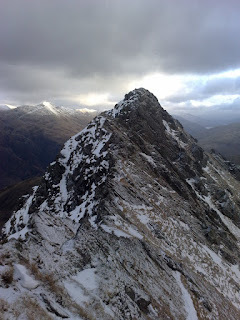 A later entry, did this a couple of weeks ago - A BIG winter day out, 24 km and 7 Munros. We parked at Cluanie Inn and walked up the tarmaced access road in the dark. Navigation didn't start well as we couldn't find (by headtorch) the small track that climbs upwards to Loch a Mhaol Dhisnich and we lost 20 minutes seeking it out. We crunched on over the snow to Sgurr an Lochain (1004m) and felt the final summit of Creag nan Damh (918m) was within reach. It feels a long way to it, your legs are tired and you seem to drop height too far whilst the mountain summit never gets closer - it's getting late in the day and the winter sun is dropping. We summitted and started the decent and were in the woods close to the road as the sun finaly dissapeared. Note - we had 2 cars which helped enormously. Also we found a second track up to the col between the first 2 summits. Finding tracks first time and knowing the short cut would probably save 45 minutes. 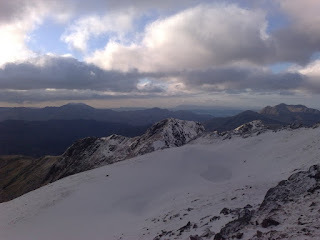 It's probably best to avoid a 24km 7 munro route during the shortest days - but a fantastic adventure. 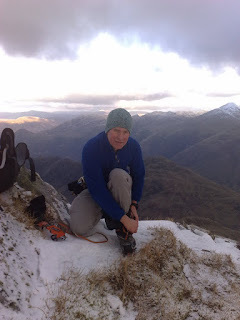 A great day mountaineering with Paul in Glenshiel. Just past a small bridge on the Glen Shiel road we parked and climbed uphill to the Forcan Ridge where Paul put his crampons on. 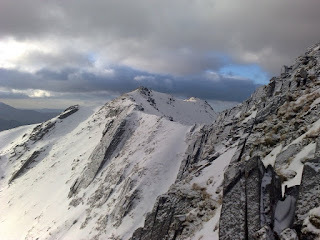 We scrambled along the ridge, ice axe in hand, snow and ice on the rocks, to the Munro summit of The Saddle 1010m. Paul led on, practicing his navigation across the snowy ground, and we climbed up to Sgur na Sgine 946 for our second Munro of the day. We walked down to collect the cars and stopped the night in the bothy bunkhouse by Kintail Lodge hotel - wonderfully welcoming and warm after a winter skills mountain day. Monday was a wintery morning in the Lakes with frosty pinpricks and a solid veneer if ice on the car. Winter climbing looked good for the evening. The day was nice and a bit of lower level navigation practicing map reading skills was very enjoyable, scrambling up through woods and looking over to High Street; a wonderful long ridge walk across a whaleback of a mountain. Adventures were shortened today as Dan and I decided not to ice climb at night but opted for mugs of tea and talking about rock climbing, instructor and mountain leader skills, whilst outside it drizzled.